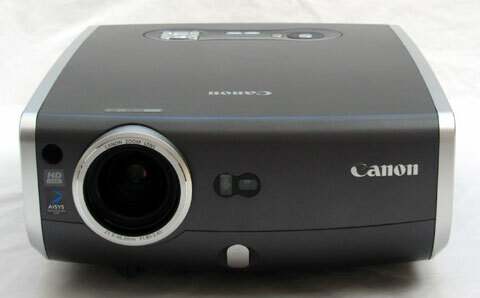 The last Canon SXGA+ projector we had the pleasure of viewing in our lab was the REALiS SX60 in June of 2006. Now the REALiS SX7 extends Canon's product line in this unique resolution format, which is 1400x1050-or high resolution 4:3. The SX7 has the honor of being one of the only 4,000 lumen SXGA+ projectors under $10,000, and in fact it sells for street prices close to half that much. With a razor-sharp picture, superb color accuracy, an exceptionally bright image, and surprisingly good contrast, the Canon SX7 is a fine choice for photographers, medical educators, engineers, graphic designers, or anyone who requires the display of very high resolution 4:3 images. Light Engine: 1400 x 1050, native 4:3, three 0.7" LCoS panels with 275W NSH lamp. Connection Panel: One composite video, one S-Video, one VGA port, one monitor pass through, one DVI-I port, one USB port, one service port for maintenance, one 1/8" audio in, one kensington lock. Lens and Throw Distance: 1.7:1 powered zoom/focus lens. Throws a 100" diagonal 16:9 image from 9'7" to 16'2". Lamp Life: 2000 hours, 3000 in eco-mode. Replacement lamp price: $430 street. The SX7 shares the same case as the other models in the REALiS family, which is three inches longer than it is wide. The lens is mounted off-center on the front of the case, next to a light sensor and a remote IR receiver, while the connection panel and exhaust vent are on opposite side panels. Canon's marketing literature describes the SX7 as an "Ultra-portable" SXGA+ projector. While that term is a bit of a stretch, the SX7 is in fact one of the lighter SXGA+ projectors available, and it comes with a sturdy carrying case. There are several other SXGA+ projectors which are lighter than the SX7, but they sacrifice anywhere between 500 and 1500 lumens as well as other convenience features in favor of lighter weight. The 1.7:1 powered zoom/focus lens gives the SX7 the longest zoom range available on a portable SXGA+ projector. The SX7 is easily bright enough to project a 200" diagonal 4:3 image, and it can project an image of that size anywhere from 19' 7" to 32' 6" away from the screen. The best part, though, is that the SX7's lens only loses 22% of its light output when at the maximum telephoto setting, which is outstanding. Often, zoom lenses of this range can curtail lumen output by 35% or more when set to their maximum telephoto positions. Speaking of brightness, the SX7 is Canon's brightest SXGA+ projector yet released, and it is in fact one of the brightest SXGA+ projectors available under $12,000. The SX7 is rated at 4000 lumens, and our test unit measured a maximum of 3327 lumens. This gives the SX7 the somewhat unique ability to be used in rooms with significant ambient light or on very large screens. If you are into old classic films and want a large scale 4:3 screen to view them in their original aspect ratio, the SX7 is a superb choice for this use. In its optimum video mode it will easily light up a 150" 4:3 screen. The SX7 has several image modes, labeled Standard, Presentation, Movie&Photo, adobeRGB, and sRGB. Our reading of 3327 lumens was obtained in Presentation mode, high lamp, with the zoom lens at its widest angle position. For situations not requiring so much light output, Standard mode offers a maximum output of 2693 ANSI lumens in high lamp mode or 1946 ANSI in low lamp mode. In all operating modes, the option to use the low lamp setting will cut lumen output by 28%. Movie&Photo mode netted 1220 ANSI lumens as well as increased contrast, and produced a bright, high contrast image that would be best suited to a dark room viewing environment. Our personal favorites were adobeRGB and sRGB, which offered excellent compromises between brightness and color balance. At 1531 and 2706 ANSI lumens respectively, either of these modes would be ideal for material where color accuracy is a priority. Of course, one of the most important qualities of any high-resolution projector is the sharpness and clarity of the image. The Canon SX7 is sharp as a razor with native 1400x1050 content, which is to be expected. And due to the combination of the SX7's high resolution and the naturally smooth image of LCOS projectors, the SX7 has no visible pixelation, even when standing very close to the screen. But how does it perform with non-native material? We hooked the SX7 up to a laptop displaying a standard 1024x768 XGA signal. In this configuration, material like PowerPoint slideshows and photography did not suffer one bit. The image on screen appeared smooth, yet detailed. Using graphically challenging PC games, the experience was likewise satisfying, with pixel-perfect accuracy maintained throughout the image. The SX7 is a true multi-purpose projector. Not only does it deliver sharp data and graphics images, but it did a wonderful job of compressing 1920x1080 video to fit in a 1400x787, 16:9 pixel matrix. The projector did crop the image slightly, losing about 2% of the image from the bottom and 1% from the right side, but this is rarely noticeable outside of a test pattern. The final test was to play back content from a 4:3 standard definition DVD. With film content, the SX7 produces a smooth image that is a pleasure to watch. There were some artifacts present with video content, including some slight moire patterns in suit jackets and fine textures. However, If you are a fan of old classic films, or watch a lot of TV series on DVD, the SX7 gives an excellent, bright image with lots of snap on a very large screen. The SX7 is rated at 1000:1 contrast, but it has no auto iris. This means that the 1000:1 figure is native contrast. Despite this rather low contrast rating, Canon SX7 performs much better than one might expect. On a white screen, video material showed good shadow detail and relatively solid blacks. Switching to a gray screen improves black levels and color saturation, and yields a beautiful picture that one would not think possible from a projector rated at 1000:1 contrast. The performance of the SX7 with video is good enough that we have no qualms about recommending it for dedicated use in a large scale 4:3 home theater.